"I never met a Decepticon I didn't dislike." Profile: Conversations don't come easy when Bluestreak is around. 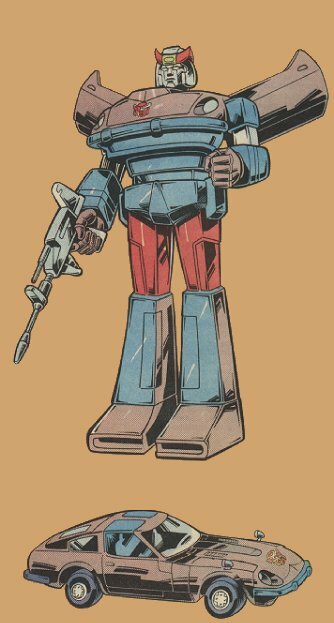 His talent for incessant and often inane talk tends to drown out those close by, but at least his gregarious manner serves to lighten the otherwise grim situation of the Autobots. What is not widely known is the underlying reason for his endless droning: to hide the fact that he hates war. Despite his formidable weaponry and his blazing speed, he is basically not a warrior type. Autobot Commander Optimus Prime's faith in him helps sustain Bluestreak in the heat of battle. Optimus knows that Bluestreak will be forever haunted by the memory of his witnessing the total destruction of his city back on Cybertron by the Decepticons. He was the lone survivor. "There's some demons runnin' loose inside that boy," says Hound, "and sometimes I think they grab hold of him and won't let him go." Abilities: In automobile mode, Bluestreak is among the fastest Autobots. He can sustain speeds of up to 150 mph for more than 12 hours. In robot mode, he carries twin shoulder-mounted rocket launchers, each capable of hurling a shell containing four independently targetable warheads a distance of 8.3 miles with a maximum error margin of 12 feet from target at that distance. Each warhead possesses the concussive force equivalent to 150 lbs. of TNT. His ion-charge disperser rifle electrifies a line of particles in the air in the direction in which it is pointed. By its nature, its accuracy is limited, but it can shoot an electrified particle beam, resembling blue lightning, a distance of 12 miles and punch a 10 foot hole in a cinder-block wall. The electrical charge of a single bolt can be as high as 80,000 volts.